Do I have to pay for Sly Fox Shopper? No. 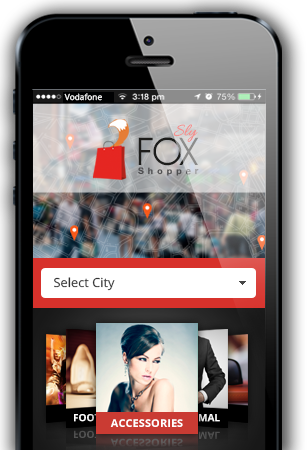 The Sly Fox Shopper app is a completely free way for you to find out about the best bargains in your area. You don't need any account and you won’t ever be asked for your card or bank details in order to download and use the mobile phone app. What if my town isn’t listed? We’re rolling out Sly Fox Shopper really fast throughout the UK, so if your town isn’t listed yet, don’t worry, it soon will be. Just come back over the next few weeks, or register your details on our mailing list when you download the app, and we’ll let you know straight away when it is. And remember, you can still use Sly Fox Shopper to find bargains in other towns and cities that are already listed. Who is my deal with? You or the retailer? It’s with the retailer. They just let us know about their best offers, then we tell you via the app or the website. What do I have to do to get the app? It’s simple. Just download it onto your phone and remember there is no account to setup. You can use the app as soon as you have downloaded it. Are these discounts and deals in real time? Yes. That’s what’s great about Sly Fox Shopper. Not only is it the most convenient way to discover bargains you wouldn’t otherwise know about, but you’ll also know about them the instant a promotion starts. Find bargains fast with Sly Fox Shopper. What sort of products and services will I find on Sly Fox Shopper? Clothes, cosmetics, footwear, sports gear, electrical goods, technology, games, beauty treatments, car accessories, fitness products, healthcare, stationery, food and drink … you’ll find them all at Sly Fox Shopper … and lots more. What if I want to shop somewhere other than my home town or city? No problem. Just tell Sly Fox Shopper where you are and it will alert you to the biggest and best bargains nearby. You’ll even get directions on how to get to the store. Can I only use Sly Fox Shopper on my smartphone? No, you can also find bargains and deals right here on the Sly Fox Shopper website - a great way to plan your shopping trip before you go out.